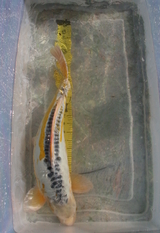 Below are the six parents of these young koi. They were bred here in 2012. 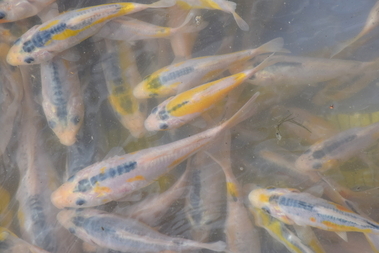 Close-ups, (below) of some of the best tosai from this harvest. 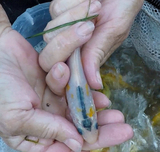 The photos were taken from the video as they were culled to keep for future review. 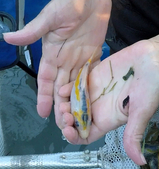 On May 9th, 2018, we harvested the F2 Ki Shusui from the Lower Pond. 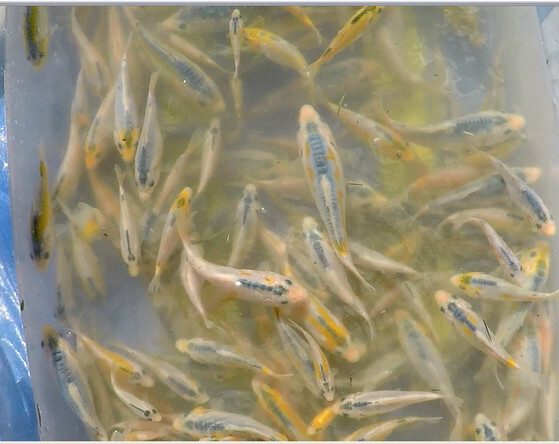 The cold weather parted for a time and we had a sunny and rewarding day pulling the pond and inspecting each of the 770 offspring! The youngsters grew over the endless winter of 2017-2018 - six months without food from a human being! 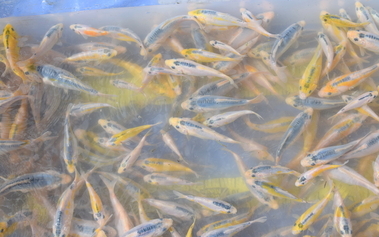 We had few losses and pulled 770 one year-old tosai that we've kept to be reviewed again in October 2018. I've posted new pix here and I'm still gathering more. We'll have more pictures and Youtube video or two for you as well shortly. 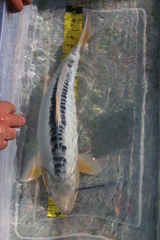 I am a backyard breeder with aspirations to stabilize the elusive ki shusui. 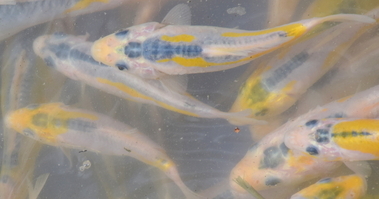 Historically, this variety has only been achieved as a byproduct of crossing midori koi, but I was inspired to create this variety directly through "line breeding." Two generations have been spawned since 2012 and I am now about four years from my goal of being able to cross a pair of ki shusui and get a high percentage of ki shusui offspring. Target date is 2021 -2022! I fell for shusui. I loved everything about this variety. It just spoke to me. When I learned that there was a yellow version of shusui, "the elusive ki shusui," I couldn't find any. 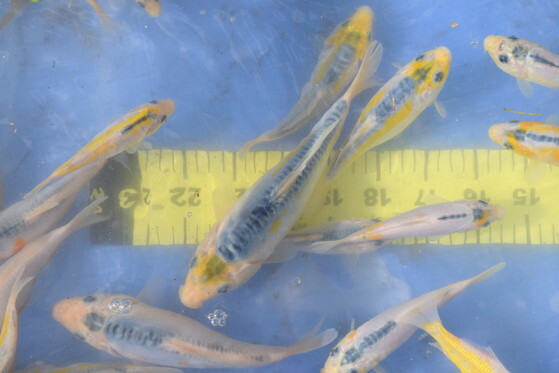 I found a photo without attribution to a breeder or anything about the fish, itself. You can see that iconic ki shusui on the front page of my web site. By 2009 I had learned that if midori is crossed with midori, ki shusui was sometimes produced as a byproduct. The formula for midori is shusui x doitsu ogon. I purchased midori, shusui and ogon from Japanese breeders and added in "a twist" of doitsu lemon hariwake. I was trying to build "a line" of midori, and cross them with hopes of ki shusui as a byproduct to use in a breeding program going forward. If I couldn't buy ki shusui, perhaps I could breed them. 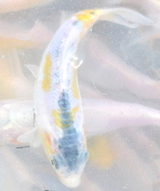 By 2011 I understood that the "twist" of hariwake, a metallic koi, created kin sui, a metallic shusui. This wasn't the goal. So I started again. 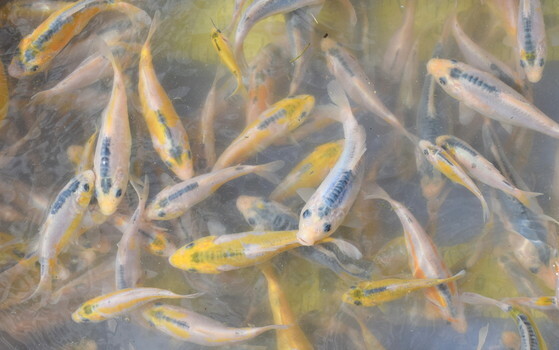 I purchased the grandparents of the offspring on this page: three female shusui, two male doitsu lemon ogons, and a male midori -- and I restarted the project with those seven koi. 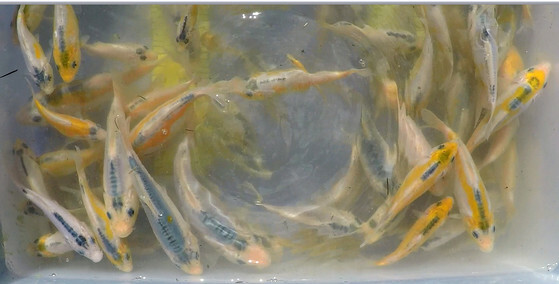 In the spring of 2012, these seven Japanese koi spawned in a quarantine tub in my basement and the eggs were transferred to a mud pond where they hatched -- 365 fry. I expected to get loads of midori -- shusui x ogon was the formula for midori --and I did! Of the midori, some were a luminous lime color. 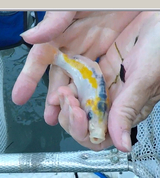 Some of them had blue dorsal scales. But along with the many midori, there was an unexpected outcome. 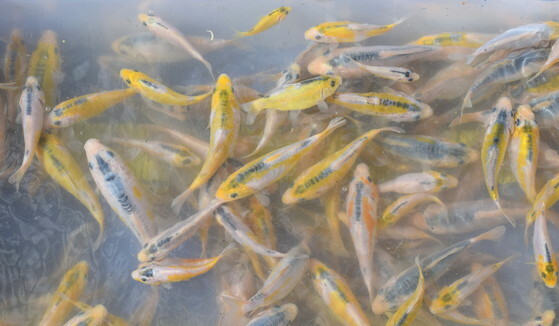 The fish I had selected for the ki shusui project reboot produced not only midori, but several dozen ki shusui-type offspring. Some were ki shusui, some were ayawakaba. Ayawakaba is a similar to ki shusui. 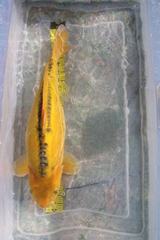 It comes from the same genetic cross of shusui x ogon, and midori x midori, differing only in that in ayawakaba, the signature yellow bands of ki shusui, cross the dorsal line. 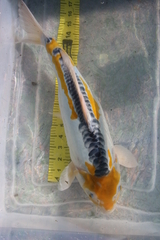 In other words, by finding so many ki shusui and their genetic twins, ayawakaba, we skipped a generation of crossing midori x midori, another of refining the offspring of that cross and saved a minimum of four years. We had ki shusui to work with and those 2012 ki shusui offspring (F1) are the parents of the (F2) youngsters shown here. 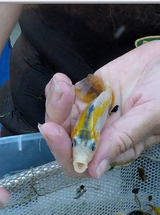 Breeding these koi has been an amazing experience. In May 2018, we harvested the tosai on this page and returned them to the mud for the summer. 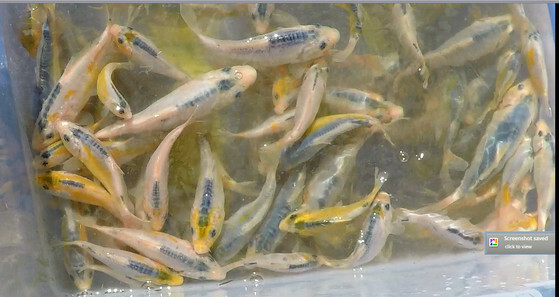 In October 2018, we will cull, further consolidating desirable traits in an attempt to produce a stable breeding line of ki shusui. To the best of my knowledge, line-breeding ki shusui has not been done before.